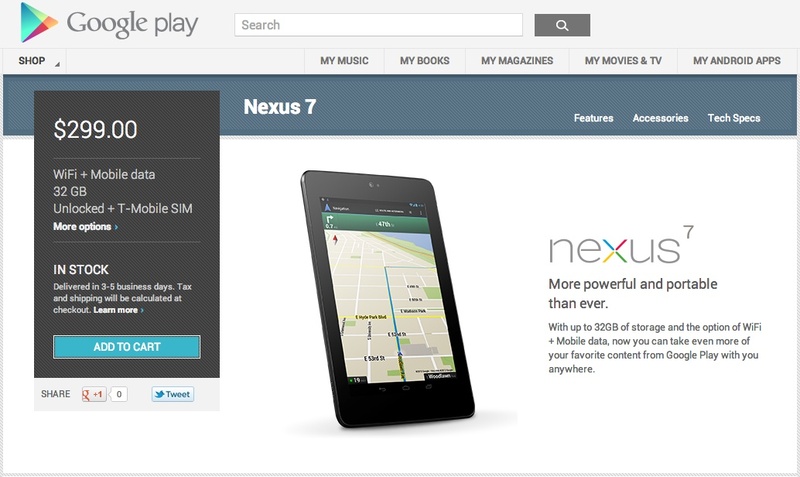 Up until today, Google was selling their HSPA+ Nexus 7 with an AT&T SIM card, so that users who bought the device could quickly get it connected to AT&T’s network and use it on the go. The AT&T pairing was a bit surprising at first, since the device is actually “unlocked.” After all, T-Mobile also has an HSPA+ network here in the U.S. and wasn’t mentioned anywhere near the device. Well, until now. As of this afternoon (or some time recently), Google added a new page for the Nexus 7, pairing the HSPA+ version with T-Mobile as well. It’s the same 32GB unlocked version only it comes with a T-Mobile SIM. So just as with the AT&T version, you can open your tablet the minute it arrives on your doorstep and connect to an HSPA+ network.